Originally published on Outlier, Opower’s blog. An updated analysis published last month by the Lawrence Livermore National Laboratory suggests that the USA is just 39% energy efficient. Put another way, more than half (i.e. 61%) of the energy that flows through our economy is ultimately wasted. 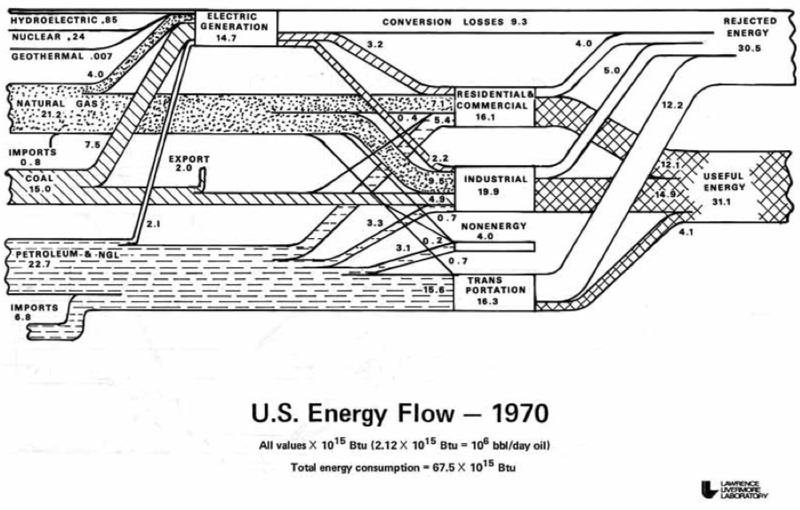 The predominance of inefficiency is conveyed by the energy-flow diagram below: it shows the country’s energy fuel inputs (e.g. 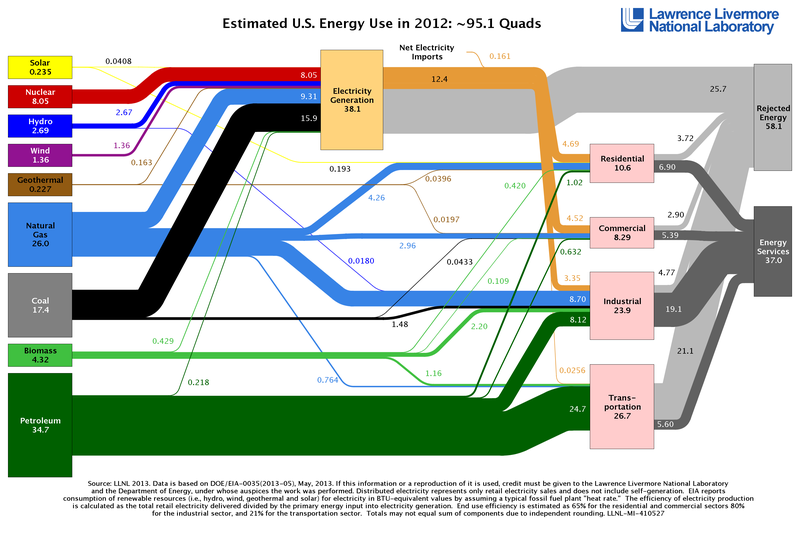 coal, natural gas) on the left side, and end-use energy consumption (e.g. residential, industrial, transportation) on the right side. One should not expect any economy, power plant, or car to be 100% efficient. Indeed, the Second Law of Thermodynamics tells us that achieving perfect thermal efficiency is as possible as unscrambling an egg. But 39% efficiency? It certainly leaves some major room for improvement. And some experts argue that even 39% efficiency is painting a rosy picture: defining energy as the “capacity to do useful work” (rather than strictly as a commodity measured by its energy content), physicist Robert Ayres and his colleagues estimate that the true energy efficiency of the US economy is closer to 14%. So how does Lawrence Livermore National Laboratory’s 2012 energy flow analysis compare to its analyses in recent years? Strikingly, their findings suggest that 2012 was the most energy-wasteful year in more than a decade (and the third most profligate year since LLNL began producing these studies in the 1970s). By LLNL’s historical calculations, the amount of energy wasted annually has hovered between 50-58% during the last ten years. But in 2012, their waste calculation shot up to 61%. Simon’s team now estimates that US cars, trains, planes and the like are on average 21% efficient (rather than 25%, as previously surmised) and US household energy uses like heating, cooling, and lighting are on average 65% efficient (rather than 80%). Holistically, these estimates may yet still be overly optimistic, in that they don’t reflect behavior-related energy inefficiencies, such as over-drying one’s clothes or leaving the A/C running in an unoccupied house. Since 1970, however, the substantial growth in energy use for electricity and transportation — sectors that, as mentioned above, are historically poor at turning fuel into work — has caused energy waste to gradually prevail over energy productivity. 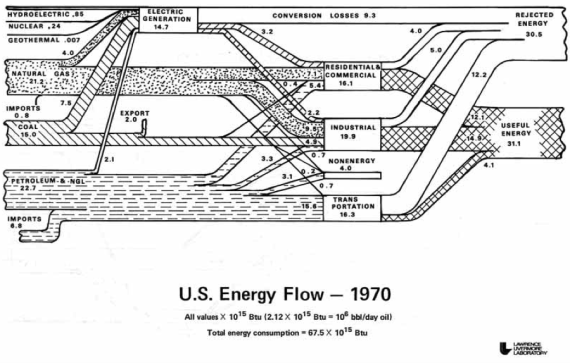 Fortunately, though, the nation is seeing a promising wave of technological advances, utility-sector innovation, behavioral science approaches, and policy breakthroughs that are helping to make energy productivity not just a serendipitous achievement in 1970, but an enduring reality for the decades ahead.